It is not easy to innovate in a highly competitive industry and even harder to disrupt an industry like insurance with well-entrenched policies and procedures to deliver more efficient and effective ways to improve processes. So when a well-respected third party research analyst firm honors you with an award acknowledging your commitment to simplifying business processes and creating truly transformational technologies, it is pretty exciting! That is what happened this week to CalAmp thanks to our Insurance Telematics team. 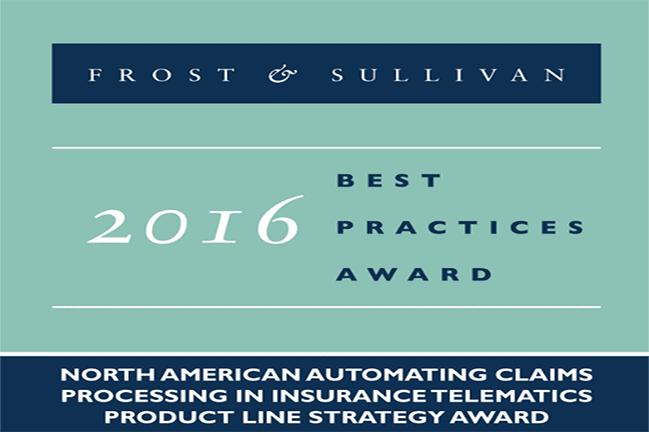 Frost & Sullivan recognized CalAmp with the 2016 North America Frost & Sullivan Award for Product Line Strategy Leadership for its automated First Notice of Loss (aFNOL) and automated First Notice of Injury (aFNOI) applications. CalAmp’s aFNOL and aFNOI applications are designed to enable insurers and telematics service providers to reduce costs and improve efficiencies related to underwriting and claims processing. Frost and Sullivan chose our aFNOL and aFNOI applications for the award based on the sophisticated math modeling tools and extensive vehicle testing we conducted to develop our crash algorithms and predictive analytics. This extensive modeling and testing allow us to deliver highly reliable collision reporting, vehicle damage estimates and bodily injury predictive estimates. The overall impact on customer value from optimizing claims operations, lowering fraud and ultimately improving profitability for insurers was also sighted as justification for the award. We are excited and honored to be recognized by Frost and Sullivan for our aFNOL and aFNOI applications and look forward to working with insurers to take advantage of these technologies to reduce underwriting costs, streamline claims processing and boost policyholder retention rates. For more information on CalAmp’s Insurance Telematics solutions, please visit our Insurance Telematics Overview.